Considering getting a helix piercing? If the answer is yes, then read on to find out everything you need to know about this ear piercing! 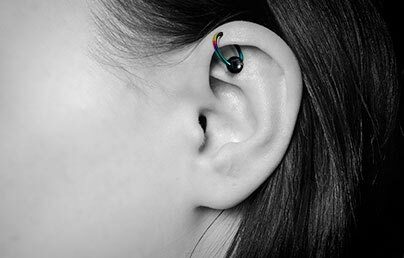 Perhaps one of the most popular types of ear piercing, after the traditional lobe piercing, the helix piercing is the ideal option for those seeking something a little more adventurous. Perforating the upper ear cartilage, the helix piercing is the perfect choice for those that are looking to expand their existing number of ear piercings. Furthermore, due to its location, the helix piercing is easily concealed when needed. In general helix piercings, either single or double, take place on the upper cartilage of the ear, however it is possible to have also have your inner helix pierced, where the ear bends around to meet your head, this piercing is known as an anti-helix or forward facing helix. Although this style is equally as popular, we highly recommend you discuss this option with your piercer. As this piercing requires minimal head movement to maintain accuracy, it is common for many piercers to ask the client to lie down. Many piercers choose to block the opening of the ear canal with a form of cork to prevent any foreign objects from entering during the procedure. After sterilising the ear and marking the agreed position, the piercer will utilise a sterile, hollow needle to create the piercing channel. The needle should remain inside the channel until after the jewellery is added to maintain its shape. Unfortunately not everyone is suitable for a helix piercing. Those with a lifestyle that is heavily sports orientated are highly recommended to discuss the effects of the piercing with their piercer. In many situations, depending on the piercing location and sport, they may suggest impact resistant jewellery or flexible retainers after the healing process. This piercing can be slightly tricky to place correctly, so it’s advisable to visit a piercer that has plenty of experience in performing this specific piercing! Most people report that a helix piercing is moderately less painful that many other piercings. This may be due to the fact that the upper ear cartilage is without any nerve endings. After jewellery is inserted into the newly formed piercing channel, it is common to feel a little discomfort and for minor bleeding to occur. However, it is worth bearing in mind that everyone experiences pain differently, so this ‘pain rating’ is purely anecdotal. This piercing typically takes between 6 -8 months to fully heal, however this is purely dependant on the individual. It’s important to maintain good standards of hygiene and a thorough aftercare routine to avoid the risk of infection. It is advised that you clean the piercing with a sterilized cotton ball and salt water solution at least twice a day to help reduce the risk of infection. Whilst other piercings are often protected, the helix piercing can often be troublesome due its exposed positioning. This location often means the piercing is at a greater risk of either being knocked or caught on long hair/hats, however by ensuring long hair is kept tied back and correctly adhering to the aftercare guide, your piercing will be at less of a risk of becoming unnecessarily infected. It is highly recommended that you refrain from utilising shower scubbys/soap savers, or if so you use them with caution to refrain your piercing from getting caught! The helix piercing can accommodate a wide range of jewellery. 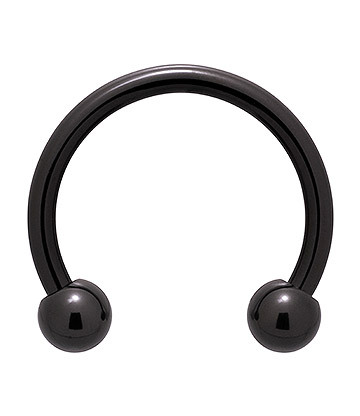 If you’re planning on wearing jewellery that is of a larger gauge to what you were provided with when pierced, we recommend discussing this prior to getting the piercing, or paying a visit to your piercer (once you’ve fully healed) to ensure your piercing can accommodate some stretching and that your anatomy is suitable prior to changing your jewellery.